Wow. That week went fast. I can’t believe it’s time for another Live Music Friday. Following on from our Alex & Angela Dezen/Damnwells post here, I thought that today we’d feature a show from The National. Aah, those Frenchmen. I swear, whether it’s my favourite La Blogotheque videos or something else, they seem to get some truly great live music out of international groups. The Black Sessions are a perfect example of this… broadcast on the French radio station France Inter, and recorded in front of a live audience, the sessions sometimes lack the intimacy that you get when listening to a rough tapers version of a show; but they make up for that in the clarity of the audio. You can learn more about The Black Sessions here, but you better have a firm grasp of French if you want to get anything out of it. One of my favourite Black Session shows was that of The National, who appeared on the show in 2005, to promote their then upcoming album, Alligator. The National, at that time, were truly blowing up while still remaining somewhat under the radar; and it shows in this set. 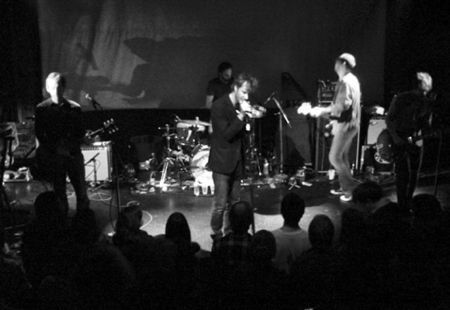 A blistering set, it features perhaps my favourite rendition of “Cherry Tree” (which featured on their 2004 album of the same name) ever… when you hear Matt Berninger repeating the mantra of “Loose lips sink ships” over and over again, in that manic tone? Man… it sends shivers down my spine. Next time on Live Music Friday? Well, you’ll just have to tune in to find out… but at the moment, the two front-runners are Bob Schneider and Ryan Adams. If there are any preferences, drop a line below and let me know. Well, so far the Bob’s have it… anybody else want to throw their vote in?